Mali Mish - Day 16: Into the Rockies. Fruita, Colorado has treated us really well since we reemerged into civilization after our 10-day stint in Utah. We needed the 5-day stay to unwind and take things easy. Especially for Marlene who was on the verge of a panic attack after 10 days of driving through some of the most amazing but hair-raising mountain roads via Scenic Byways 12 and 24. We are leaving today because in 3 days, we will need to be in Denver for Alumafandango. We are giving ourselves plenty of time to meander our way there because we have no idea what the Rocky Mountains have in store for us. 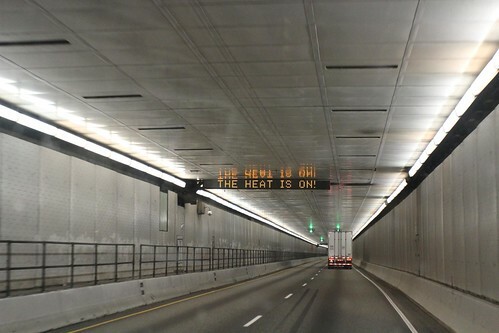 We have been doing some research about climbing up and over the I-70 which peaks at 11,185 ft at the Eisenhower Tunnel. We have asked several people in town about the drive and most people say that it is challenging. Come on, people! Can’t you just lie to her? It would make my life so much easier. Nevertheless, we had to eventually head out of Grand Junction and onward into the Rockies. We have heard and read in a few places that Grand Junction has become Colorado’s wine country. Too bad it was clear on the other end of town and we never got a chance to check it out. 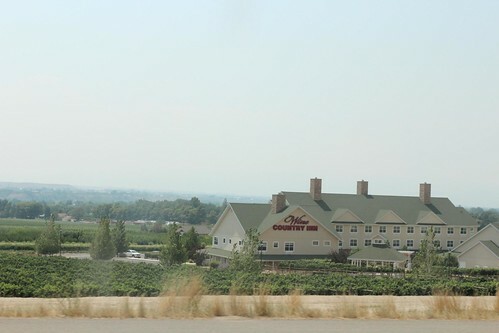 This is the closest we got to a winery: On I-70 as we were leaving. 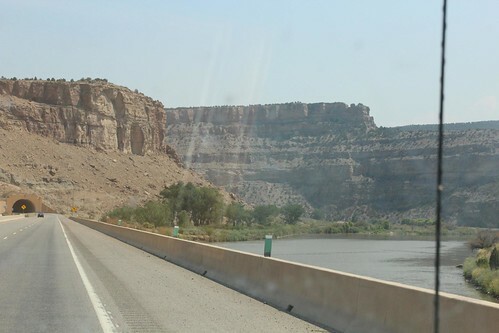 The western slope of I-70 basically follows right along the Colorado River. 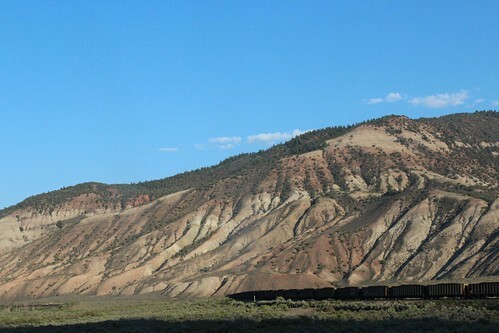 As soon as you leave Grand Junction, you begin to climb and the landscape starts to change all around you. The incline is actually pretty mild as you only ascent about 1,100 ft in the first 100 miles as you get to the next city, Glenwood Springs. 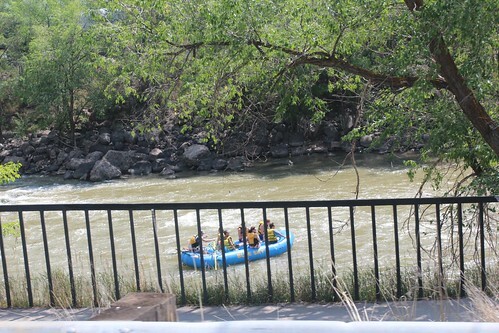 As you climb along the Colorado River, you can see lots of Coloradans doing what they love most: The outdoors. Someone needs to do something about this problem, these people just will not stop climbing; Or Fishing; Or biking; Or skiing; Or rafting; Or fill-in-the-blank-outdoor-activity’ing. Our drive today was planned so that we would do the steepest part of the climb in the coolest time of the day while still having some daylight. Not knowing what to expect in these mountain towns, we really didn’t know if we would spend a night or two in any of them. One thing we do know for sure is that Marlene will be freaking out at some part of today’s drive. We made it to Glenwood Springs in pretty good time knowing that we wanted to make it our first stop as we have heard some good things about it. It is at the confluence of Colorado and the Roaring Fork Rivers and has one of the largest natural hot springs in the country. At 5,700 ft of elevation, Glenwood Springs gets a decent amount of snow in the winter time. 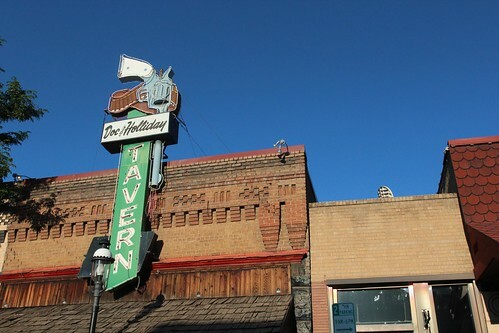 Being only 40 miles from Aspen and 60 miles from Vail, it is a popular place to visit all year round. The town was originally founded in 1883 as Defiance, Colorado. The founder’s wife had a hard time adjusting to the frontier life and she asked her husband to change the name to make her time here more bearable. 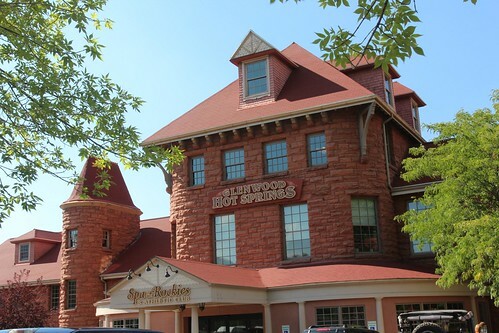 Some of the more notable residents and visitors of Glenwood Springs are Doc Holliday of Tombstone fame who lived the remainder of his life here before succumbing to tuberculosis. He is buried in the town’s old cemetery. 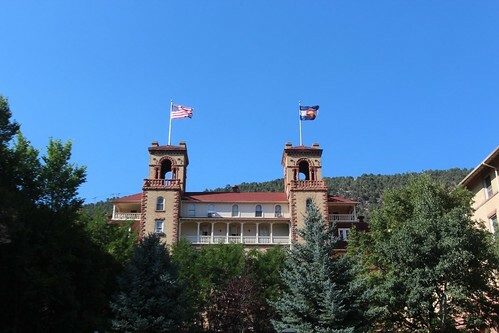 Also Teddy Roosevelt once stayed an entire summer here on vacation at the Hotel Colorado. 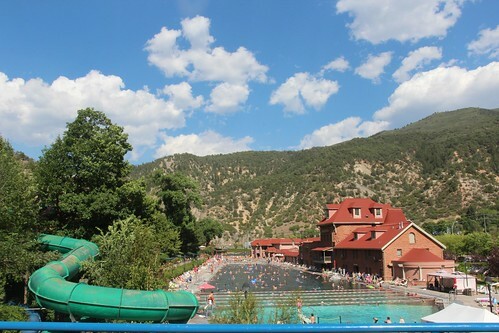 Glenwood Hot Springs have naturally heated spring water pools year round at 90-100 degrees. Since today is Saturday, this place is packed. It isn’t cheap to go in there for a swim. It would have cost us over 50 bucks to get all of us in for just the couple of hours we had left in the day. The girls were not too thrilled that we were going swimming but since we are the grownups, we make the decisions. Just past the hot springs is the Hotel Colorado. It was built in 1891 by the silver magnate Walter Devereux. It is built to resemble an european hunting lodge and a replica of Villa Medici in Rome, Italy. 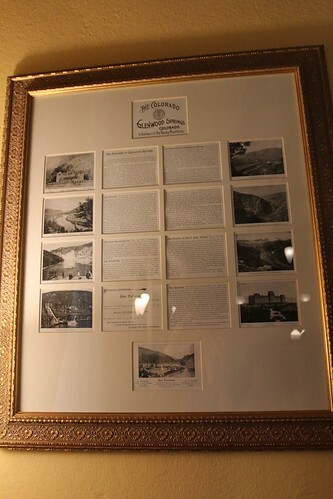 It opened its doors in 1893 and quickly became a popular vacation destination. 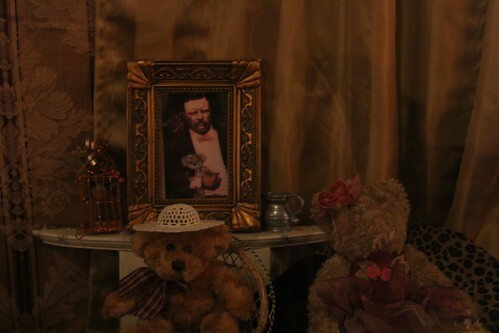 The teddy bear was allegedly first coined here in 1905 when the maid of the hotel presented the vacationing Theordore Roosevelt with a stuffed bear, nicknamed “Teddy” by his daughter. The hotel was also commissioned in 1943 as a US Navy Convalescent hospital during World War II for 3 years. It returned to a hotel once it was decommissioned. Several ghosts are also known to haunt the building. Apparently the elevator is know to run on its own without passengers and sightings of a woman in a Victorian dress has been seen by multiple guests. We wished we were staying the night here in the hotel with such a rich history as well as the hauntings. We are definitely going to have to come back another time. Hopefully one of our kids will still be able to see ghosts by then. 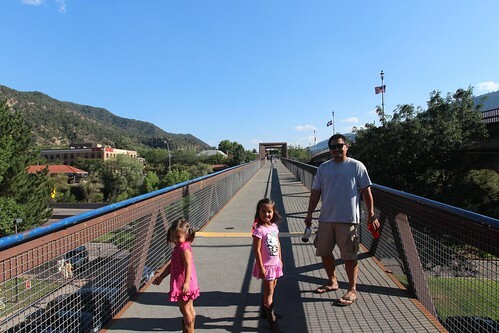 Being on the other side of the Interstate from downtown Glenwood Springs, you have to either drive across the bridge or use this pedestrian bridge. Guess who is scared of walking on it? Just before we head back to the car and continue our way up the Rockies, we stopped and had an early dinner at a local burger joint called Grind. 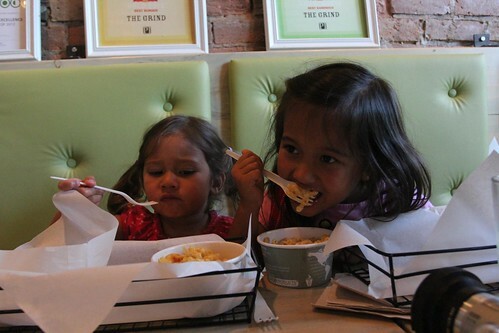 They use local, grass-fed beef and is ground daily right in the store. Kind of reminds me of the old days of Steak-N-Shake when they would pull out a meat grinder right in the middle of the dining room floor to demonstrate the freshness of their burgers. Except this place is much more hipster friendly. Even though we didn’t get to visit Doc Holliday’s tomb, we did drive by the Doc Holliday Tavern. That is kind of the same, right? We are definitely going to need to come back here. As we headed back up I-70, you can start to tell that the elevation is starting to change the ecology. Denver is still about 160 miles away from Glenwood Springs but we are steadily climbing upwards towards the peak of the pass. The I-70 really is a pretty amazing feat of engineering. For a lot of the way, the freeway is essentially a bridge that hovers over the Colorado river. 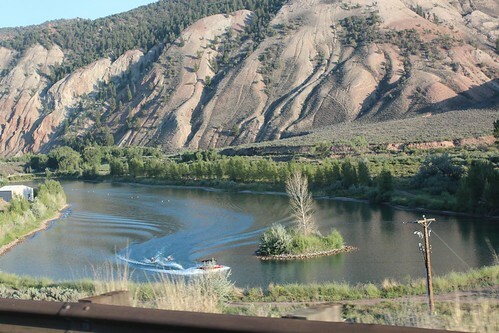 Just along the other side of the river, you can see the transcontinental railroad that also passes through the Rockies along the river. Once again, these Coloradans can’t help themselves but to do stuff outdoors. These dudes probably spent the whole day here water skiing in a figure-8 slalom course. 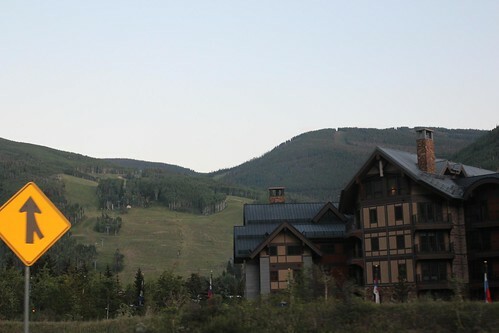 The first major climb is just past the resort town of Vail. We didn’t bother stopping there for a couple of reasons. One is that it was starting to get dark and we had some more climbing to do before reaching the peak. The other is because in many of the literature we read about Vail, they told us to don’t bother stopping if we are not willing to spend some big bucks to get anything. We will be content with photos taken from the Interstate. We cruised up Vail Pass in low gears going about 40 mph without any problems. The engine stayed nice and cool the whole way up to just past 10,662 ft. On the way down the descent takes you back to about 9,500 near the town of Silverthrone. 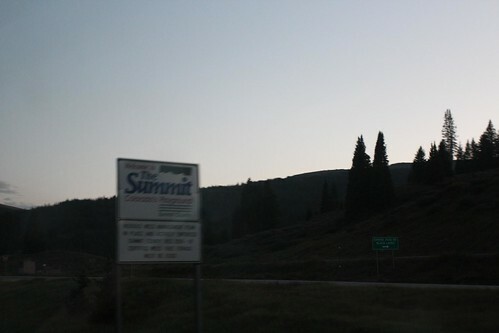 By the time we started the 2,700-ft over 9-mile ascent to the Eisenhower Tunnel, it is pretty much completely dark. Of the 3 kids in the back of the van, Ava is staying up to see what the hype is all about and to give her mamma moral support. We have been talking about this climb for over 5 days and now it is finally here. The climb from the west side is more severe than from the east. That is preferable to us this time around because we are less concerned with the ascent and more with the descent. Once we get to the top, we are looking at about a 2,300 ft descent over nearly 15 miles of road. The van handled the climb with no problems. Once again, it did not overheat and trucked along in 3rd gear at about 35-40 MPH in the slow lane with the truckers. We made it to the top and into the 1.7 mile long tunnel at a whopping 11,185 ft. It beats the top of the Vail pass by over 500 feet and kills the last highest peak we have ever climbed in the Airstream back in Utah at 9,600 ft by over 1,500 ft.
Once we crossed the tunnel and started the descent, the van once again handled it like a champ. I had expected to use the brakes a lot to keep our speed at a safe range and was worried about overheating them. But instead, I decided to shift the 4-speed automatic into second gear and use the engine to help slow us down. Usually engine braking in a diesel is done with the help of a ‘Jake Brake’ like in buses and big rigs. Without them, diesel engines don’t do as well as their gasoline counterparts with engine braking. However I was able to hold the speed at under 40 MPH the entire way down the 15 mile pass without ever needing to touch the brakes. The brakes stayed nice and cool and thanks to my van’s transmission and its dedicated cooler, we had zero issues. 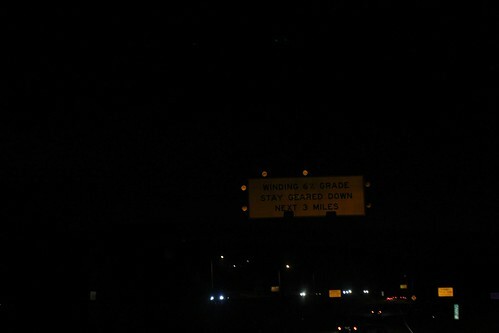 By now, we are driving in pitch black darkness. As much as I had wanted to stay a night or two in the Rockies, we were not ready to venture off on an unknown mountain road seeking for a night of boondocking bliss. We decided that driving the complete 260 miles today to Denver would be the wisest decision. Now that we know we can handle the biggest mamma jamma of all Interstate grades, we will be much more confident doing it again next time. Day 15: Downtown Fruita, Colorado. 6 Responses to Day 16: Into the Rockies. Will you be at Alumafandango? We would love to meet you and your family. Hi Frank, you bet we will be there! We will be at one of the 30-amp sites and we are looking forward to meeting you guys, too! I am glad you made it up an down with no issues. I will be out there in the future with my Airstream and I always mentally picture what it will be like to tow the Airstream to and from Dillon to my dad’s place. 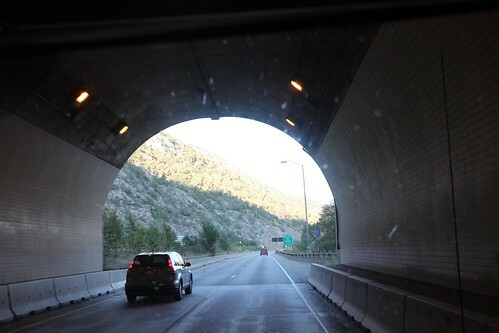 Usually, we are driving through the Eisenhower Tunnel in ski season and it is always snowing and often icy. Maybe you can take a different route back. Have fun in Denver and check out the REI store and the Tattered Cover bookstore. My kids love both stores. Be careful though, you may leave the REI store with a paddle board and struggle to find a place to put it. Hi Doug, even though I had no problems on my transit, driving through there in the middle of winter would be pretty tough. Especially since you will be driving west which has steeper grades. That being said, I don’t know what the roads are like. I am sure being an interstate, they do a pretty thorough job plowing and maintaining the roads to prevent accidents. Dillion and Silverthrone is a cool area. I hope to be able to make it back there sometime soon. Let’s try that reply again without the iPhone. The roads are expertly plowed in the winter. Summit and Eagle counties are prime time ski resorts. Therefore, the roads are a high priority. You do have to watch yourself on I-70 but you always want big snow during ski season. Most people in Colorado are well versed in winter driving. It’s the tourists (not the semi-natives) you have to worry about. I love the winter season but I used to spend a lot vacationing there in the summer as a kid. 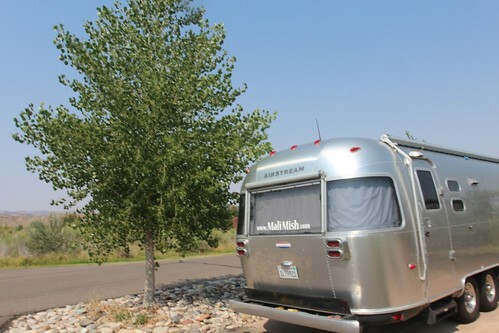 It is prime time Airstream country. If Marlene can take it, you should definitely explore Colorado in the summer. You could also go down to Colorado Springs (Garden of the Gods, Air Force Academy, Pikes Peak, Royal Gorge) or up to Boulder without climbing back into the mountains from Denver. The drive through Rocky Mountain National Park is amazing but not for the faint of heart. The only drive that is scarier is the Million Dollar Highway that is now well in your rear view mirror. I spent many a summer thinking my dad was going to accidently drive us off a cliff looking at the scenery. I do not want to repeat that experience pulling my home on wheels.